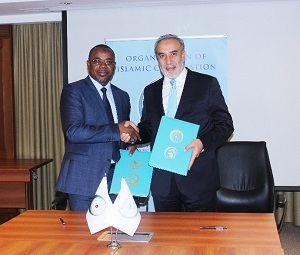 The Statistical, Economic and Social Research and Training Centre for Islamic Countries (SESRIC) and the Islamic Financial Services Board (IFSB) signed today a Memorandum of Understanding (MoU) to reinforce the collaboration on the field of Islamic finance statistics. The MoU was signed by H.E. Ambassador Musa Kulaklıkaya, Director General of SESRIC and Dr. Bello Lawal Danbatta, the Secretary-General of the Islamic Financial Services Board (IFSB). The first MoU between the IFSB and SESRIC was signed in 2012 in Istanbul, Turkey. Providing each other the platform to reaching out member organisations to extend coverage of respective databases. The IFSB – SESRIC MoU signing ceremony took place during the International Symposium on Financing for Development in Istanbul, Turkey, jointly organized by SESRIC and the Islamic Development Bank (IsDB).